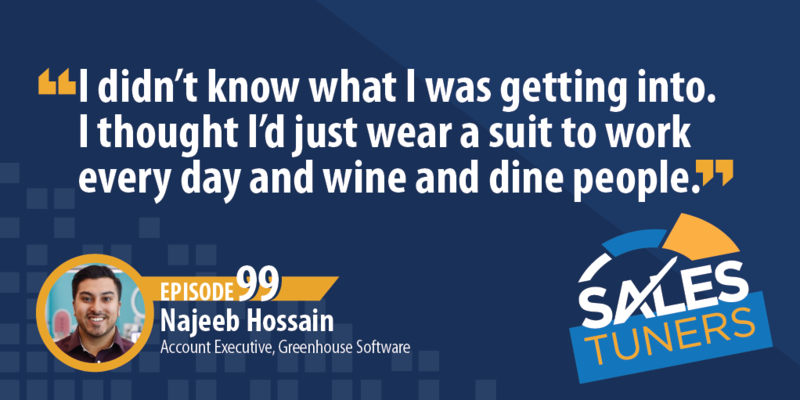 Najeeb Hossain (@AskJeeb) is an Account Executive at Greenhouse Software, an applicant tracking system and recruiting software designed to optimize the recruiting process. He currently lives in New York City, with years of previous experience at two of Boston’s top tech companies, Hubspot and LogMeIn. Najeeb can attribute his start in sales to what he calls a “Hollywood perception” of sales culture, thanks to the television show “Mad Men.” After graduating from college, he quickly landed his first sales role. He leaned into his competitive nature and curiosity to foster his professional development and success. At Greenhouse Software, he empowers companies by helping them build powerful cultures. To make this is a realty, he says, it’s imperative to build genuine relationships with clients. He attributes these relationships to credibility, as knowledge and experience gain trust with potential buyers. Know the industry, know the product, know the client, and positive outcomes will present themselves. Be Real: Sales calls should be mutually beneficial. If you’re just talking at prospects, naturally their guard is going to be up. Yes, I know you have required fields and boxes you have to check on each call, but what would happen if you worked with the prospect and said “hey, I understand what you’re trying to accomplish, here are the couple of things I need to be able to get out of the call as well.” If you’re real with them, they’ll understand you have a job to do as well and this track will disarm them. Don’t Let It Go to Your Head: The rollercoaster of emotions in sales is real. Once you start seeing some success and you find a lot of your time is being spent closing deals, realize the only way to close any deal is to open it in the first place. Make sure you’re balancing the time needed with new prospects. On the flip side, if you find yourself stringing together a bad few weeks, don’t lose your confidence. Focus on the things right in front of you and continue doing the activities you know drive success. Understand the Consequences of Inaction: If you lose a deal, it’s not like it just happens in an instant. The reality is, you lost it much earlier in the process, you just happened to find out when the prospect told you. As you’re running any sales cycle, you must understand what happens if certain things don’t take place. I mean that on both the prospects end as well as yours. If they don’t solve their problem, what happens? If you make the wrong assumptions, what happens? Minimize inaction and you’ll start seeing many more closes.